Car accidents are the leading cause of death for teenagers in Toronto, London and Peterborough. Teenagers are more likely to cause car accidents as a result of texting while driving, speeding and not paying attention while driving. Teenagers are also at greater risk of causing a car accident or death as a result of drinking and driving. Teens are more likely to operate a car or motorcycle after midnight when visibility is poor. They also have some of the highest delinquency rates when it comes to not wearing a seatbelt. Also alarming are the rates when it comes to teens yielding and leaving enough room in front when driving behind another car. This increases their chances of getting involved in a rear and collision. Teenagers also have higher statistical rates of getting a ticket from the police for speeding, careless driving, making an improper left hand turn, or other driving infractions under Ontario’s Highway Traffic Act. Toronto Personal Injury Lawyer Brian Goldfinger and his team at Goldfinger Injury Lawyers knows the inherent risks at play when teenagers get behind the wheel of a car or motorcycle and drive. Let’s set the record straight. Not all teenagers are bad drivers. Not all teenagers cause accidents on Toronto’s streets. But teenagers have always been a high risk group for getting involved in car accidents on our roadways in Toronto, London and Peterborough. Having represented teenagers, accident victims of teen driving accidents, and their loved ones in the thousands of complicated and catastrophic car accident cases in Ontario, Toronto attorney Brian Goldfinger has seen it all. From devastating brain injury, paraplegia, spinal cord injury, multiple fractures, lost limbs, broken bones and chronic pain. Teen car accidents have resulted in some of the most devastating personal injuries Goldfinger Injury Lawyers has seen over the years. Younger drivers have less experience driving than others. Less experienced drivers are at greater risk for being involved in car accidents in Toronto, London and Peterborough. That’s why insurance rates for teenage drivers are greater than insurance rates for older, more experienced drivers with similar driving records. Insurance companies have been studying the actuarial car accident data for Toronto, London, Peterborough and the rest of Ontario for years. Their studies have shown that teenagers are more at risk for being involved in, or materially causing or contributing to a car accident. Ontario has a graduated licensing system in place whereby new drivers (mostly teenagers) have to graduate from what used to be called a “learner’s permit”, to a G1 level. The G1 requires that the driver always drive with another fully licensed driver. Once the G1 level is complete, the driver graduates to a G2 level. This allows the driver to drive alone, but not on any 400 series highways. After the G2 level is complete, the driver is a fully licensed “G” level driver. Ontario’s government has found this graduated licensing system has decreased the accident rate amongst new Ontario drivers, particularly teenage drivers in Toronto, London and Peterborough. 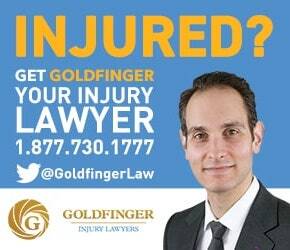 If you or a loved one has been involved in a car accident involving a teenager, or caused by a teen, such as a wrongful death or brain injury case; contact the Toronto Personal Injury Lawyers of Goldfinger Injury Lawyers for your free consultation. Let us help you understand what your rights are and assist you in getting the results which you deserve.